Hey gang! This won’t be a full review or anything, I just thought I’d post a couple of panels of Daredevil – and Matt – in action in this week’s issue of The Punisher, by Greg Rucka and Michael Lark. The events that involve Daredevil butting heads with Frank Castle take place sometime in the not too distant past, continuity-wise, and most of the issue (which I thought was pretty good) sees us following two cops around as they’re discussing Castle and his actions, rather than showing much action directly. Of course, one of the coolest things about this issue was seeing Michael Lark (with Stefano Gaudiano inking and Matt Hollingsworth on colors) draw some Daredevil again! In other news, Amazing Spider-Man #677, featuring the first of two parts of a cross-over with Daredevil, comes out on Wednesday next week and previews have surfaced in several places, including CBR. Also out next week is New Avengers #20, and there’s naturally a preview of that too. See ya! “In the not too distant past” is actually 1988. 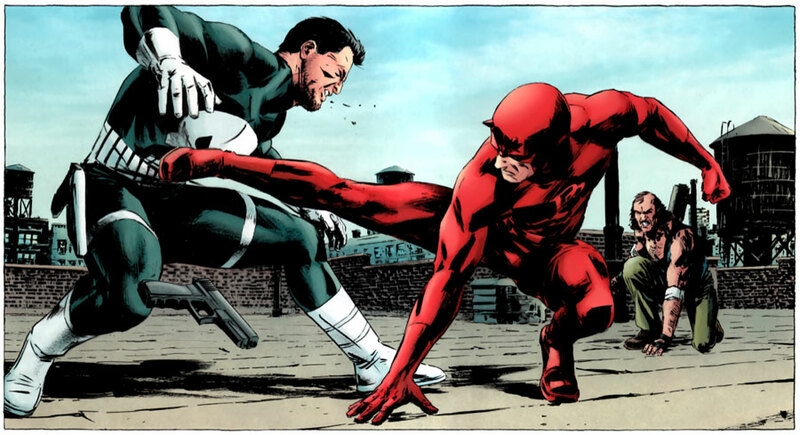 The confrontation happened originally during Nocenti’s run in Daredevil #257. Story was also published from Punisher’s point of view in Punisher #10. I loved seeing this call-back. The story, from The Punisher’s POV was published in the UK as part of a monthly Punisher ‘magazine’ in my youth. And I have the (1988)Daredevil half of that story. It was the same story told from DD POV (vs Frank Castle’s in his own book). That panel you have up is a recreation of a John Romita Jr splash page of the fight between them (which DD won of course). It’s a favourite issue of mine because it highlights DD as a more altruistic vigilante (especially compared to the Punisher).